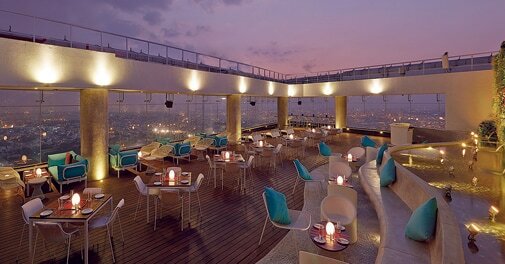 With punchy music and an aerial view of Bangalore, High Ultra Lounge makes for a great evening. The first trick to making a great bar or restaurant, and most restauranteurs will confirm this, lies in getting the right space. 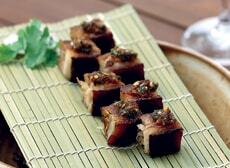 So when real estate giants enter the restaurant-lounge-bar business, the results are stunning. With 10,000 square feet on the top of Bangalore's World Trade Centre, and every possible view of the setting sun, High Ultra Lounge by construction group Brigade's hospitality wing is blessed. It has four zones, a lounge area that is open to the sky, a funky bar space, a fine dining section and a private party room with breathtaking views, and there's still space to spare. We chose a Saturday night to take the nonstop elevator to the 31st floor of the World Trade Centre, just as the dark sky overhead broke into a thunderous downpour. We hung out at the bar area, an upbeat space with a cool international vibe. Over a whimsical ginbased cocktail christened Constellation dotted with purple flowers, I marvelled at the view of the city lights under the sheets of rain. However, for a place that gets almost everything right in terms of decor and infrastructure, the food itself seemed a bit uneven. The sesame cheese rolls with strawberry, felt gimmicky, sauteed mushrooms in spicy sauce played safe, and the chicken satay was good but uninspired. But the spicy jumbo prawns hit the spot, a starter with tofu squares pushed the envelope, and the sushi - we had salmon and avocado rolls - was satisfying. The claypot mushroom fried rice and stir fried greens were paired well, conveying fresh and flavourful simplicity. And all misgivings were dispelled with the spectacular banoffie pie, a must-have if there ever was one. Viewing the city from up high, you feel the rush that accompanies the power of new Bangalore with its money, vision for the future and connections to the rest of the world. There is something of New York City's rooftop bars here, and a little of Singapore's nightclubs. Traces of other places - the intangible things that make a place truly international - also come together here, turning it into a unique setting for great things to happen. My suggestion? Don't miss it for the world!